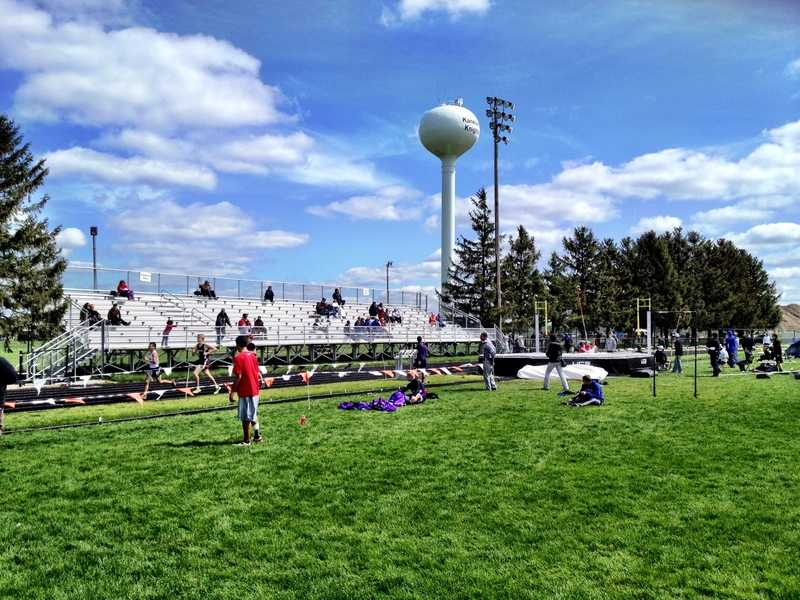 While most of this spring’s outdoor track season has taken place in weather more fit for indoor competition, warm temperatures and blue skies greeted athletes at the Kane County boys track meet held at West Aurora on Friday. Geneva and Kaneland both came out on top, tying for first with 74 points each. West Aurora followed in third place with 65 points. St. Charles North had the best showing among area schools, finishing fourth with with 56 points. 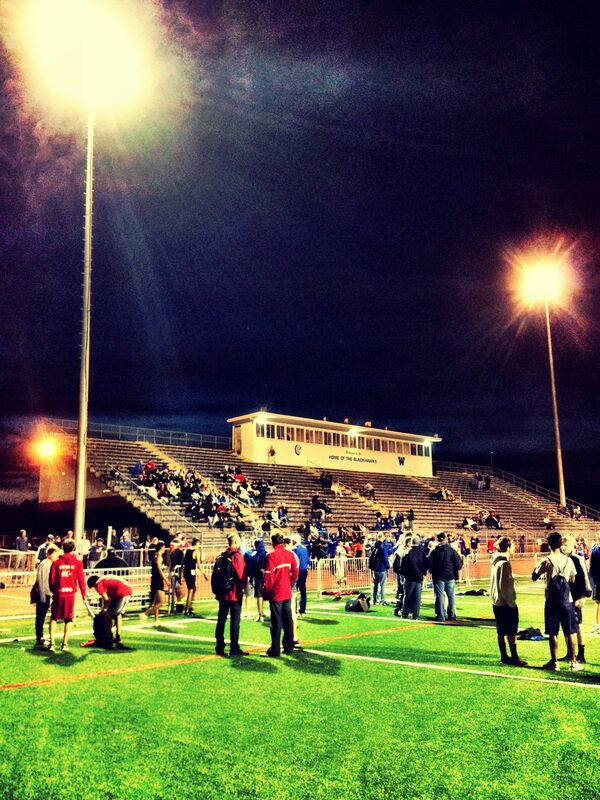 Burlington Central took sixth place with 44 points while South Elgin followed close behind in seventh with 40 points. St. Charles East took tenth with 32 points, Elgin finished 11th with 31 while Streamwood ended up in 12th with 10. Larkin finished 14th with four points, while Dundee-Crown came in 15th with one point to round out area schools. Declan Duggan was the North Stars’ lone individual champion, finishing first in the 3,200 with a time of 9:39.04. Oshay Hodges placed in four events for the North Stars. The multi-talented athlete took second in the high jump (6-7) and triple jump (43-08.75), fifth place in the long jump (20-09) and was a part of the North Stars’ third place 1,600 relay. Hodges, who has been battling a heel injury, said he was surprised by his high jump performance. “I almost got 6-9 which would have been a personal best. I know I can make that jump, I’m pretty sure I can get it next week,” said Hodges, who finished second in the high jump at last year’s 3A state meet. Burlington-Central’s Clint Kliem set a Kane County record in the 1,600 meters, winning the race with a time of 4:18.76. The senior broke the old record, set by St. Charles North’s Matt Desilva in 2006, by just .08 seconds. Kliem was also part of the Rockets’ second-place 1,600 and 3,200 relays teams. Seventh-place South Elgin was paced by Jeff Broger, who took first in both the 200 (22.41) and 400 (49.67). The junior was pleasantly surprised by his double championships. “My goal was just to win the 400. I was really nervous about the 200, I had no idea what to expect from that,” said Broger, who set a personal record in the 400. St. Charles East’s 1,600 relay team of Carter Reading, Jake Mazanke, Danny Newman and Nick Devor finished first with a time of 3:22.35. Mazanke also took home second place in the 800 (1:53.56), finishing behind Geneva’s Peter Archibald who set a Kane County record in the race. Elgin’s Devante King was the champion of the 110 hurdles race and the anchor of the Maroons’ first-place 4×200 relay team. King was also a part of Elgin’s second place finish in the 400 relay. King said he had spent most of his time in recent practices focusing on relay races, not the hurdles. “I just winged it. I hadn’t practiced the hurdles for two weeks straight,” said King. Streamwood’s 400 relay team of Blake Holder, Art Beese, Sean Patterson and Austin Mugnai took first place (42.67). Holder, the Sabres’ anchor, ran for the first time since sustaining a hamstring injury on Apr. 14. 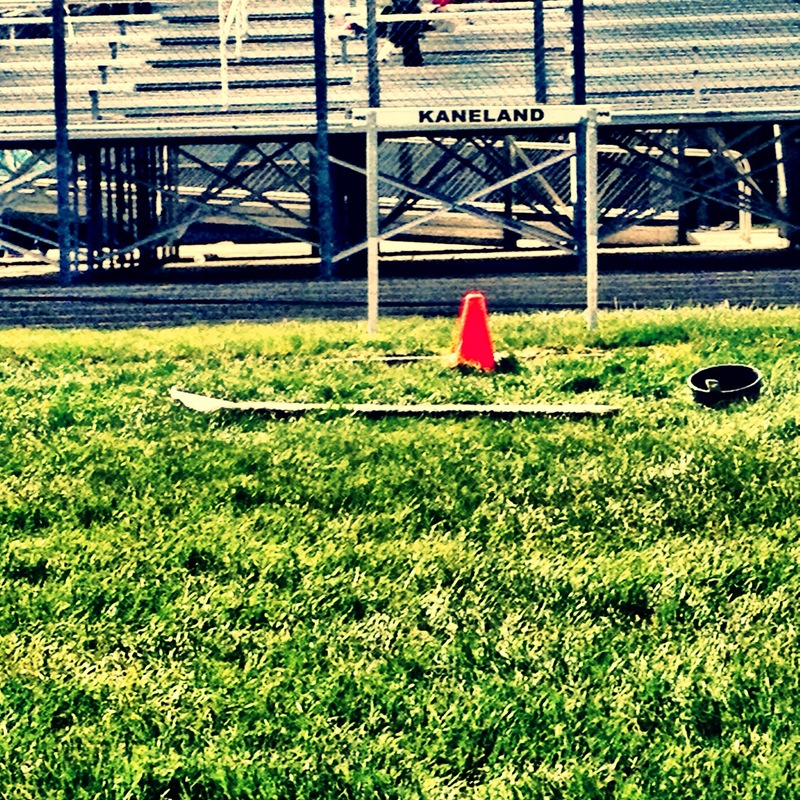 Holder, the 2011 Kane County 100 meter dash champion, did not run any individual races on Friday but said he plans on running the 100 at sectionals in two weeks. Larkin’s Cyrus French made the finals of the 400 and finished fourth (50.88). Dundee-Crown’s top-finisher was R.J. Schmidt who placed sixth in the 110 hurdles (16.26). I wrote this story for the Chicago Sun-Times and Elgin Courier. It appears here. Athletes preparing for the long jump finals with the Kaneland water tower in the background. 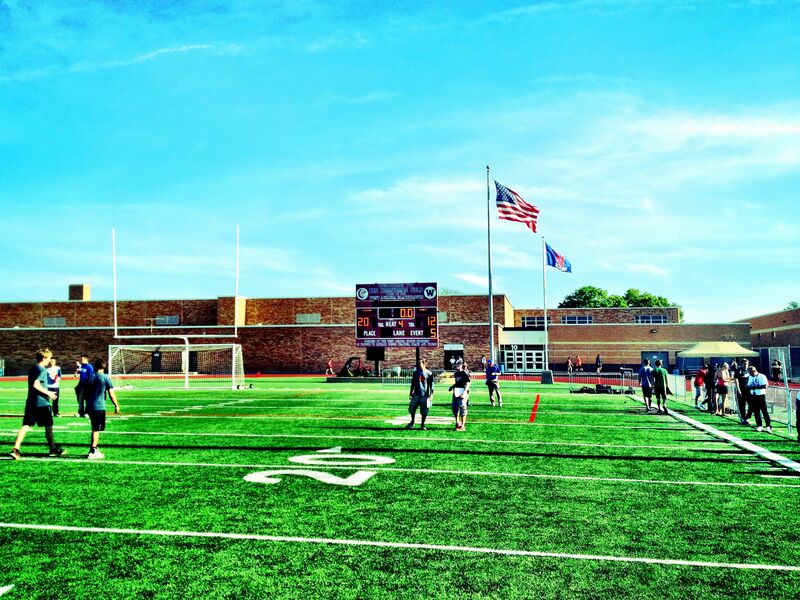 Is there anything more patriotic than an American flag flying between football goal posts? I didn’t think so (You might have to squint to see that). As someone who can’t run fast or jump at all, the hurdles races have always mystified me. 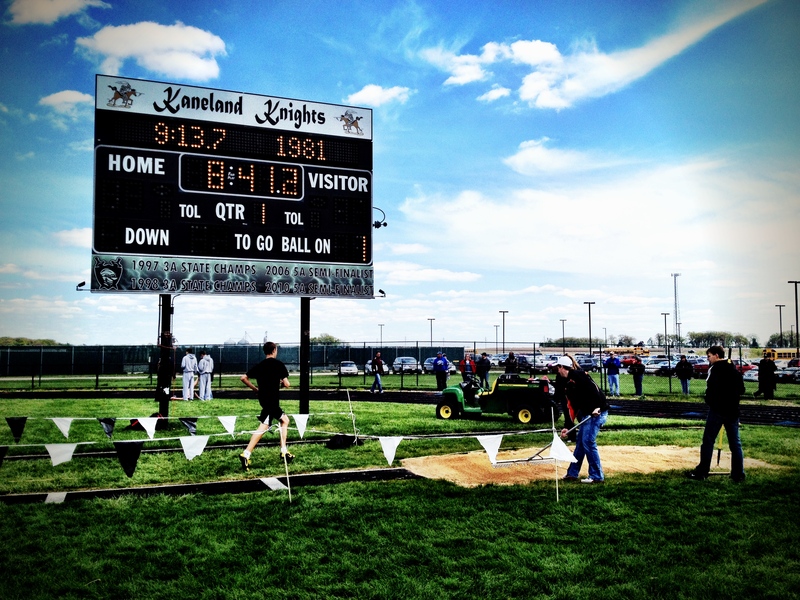 An artsy shot of Kaneland’s scoreboard and the triple jump runway/pit. Workers get the pit ready for the triple jump final at Peterson Prep. Sixteen teams came to Kaneland High School on Saturday in hopes of winning the Peterson Prep Invitational, but it was the home team that finished first. The Knights placed in 15 of 18 events, won two relays and had three individual champions on their way to capturing first place with 84 points. Geneva, who held the team lead going into the final event, ended up in second place with 75 points. Burlington Central, paced by their intermediate runners, captured third place. West Aurora finished in fourth place with 64 points, Yorkville took fifth with 45 and Oswego East followed closely in sixth with 42. Elgin came in ninth with 30 points, East Aurora finished in 12th place with 16, and Dundee Crown ended up in 14th with 9 to round out area teams. 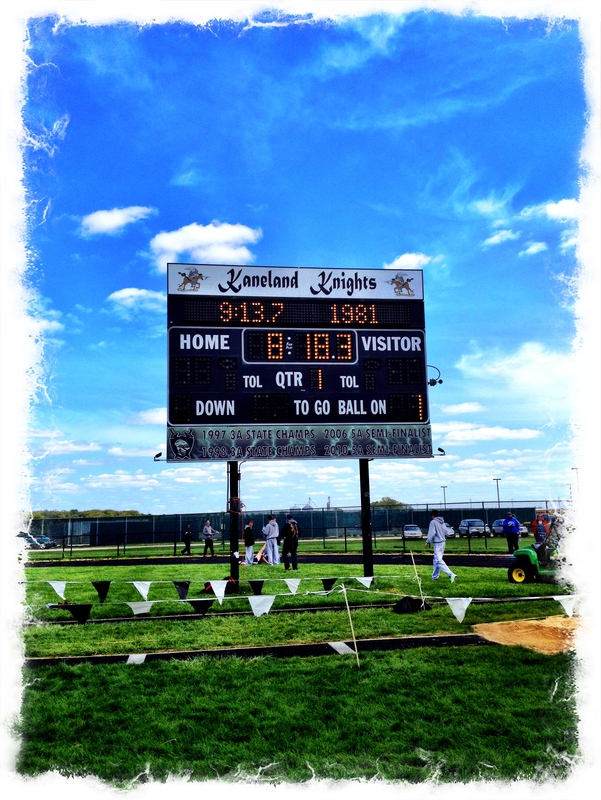 Kaneland rode anchor Sean Carter to first in the 4×100 (43.78) and 4×200 (1:31.31) relays. The Knights also finished second in the 4×400 (3:26.62). Dylan Nauert (300 meter hurdles) and Nate Dyer (discus and shot put) won individual championships for the Knights. Geneva’s Ben Rogers launched himself into first place in both the long jump (21 feet, 8 inches) and triple jump (43-11). The Vikings’ senior was held back last season by a nagging hamstring injury. This year he’s fully healthy and performing at an exceptionally high level. His mark in the triple jump on Saturday was a new personal best. The Vikings also got a big boost on the track from Justin Davis, who finished first in the 400 meters, third in the 200 meters and seventh in the 100 meters. Burlington Central runners Mike Gulik and Clint Kliem both finished in first place in three events. The two were part of the Rockets’ first-place 4×400 (3:25.43) and 4×800 (8:01.69) relay teams. Gulik captured first in the 800 meters (1:57.28) while Kliem was the champion of the 1600 meter race (4:24.38). Kliem ran the third leg of the 4×400 relay just 25 minutes after setting a personal record in the 1600. 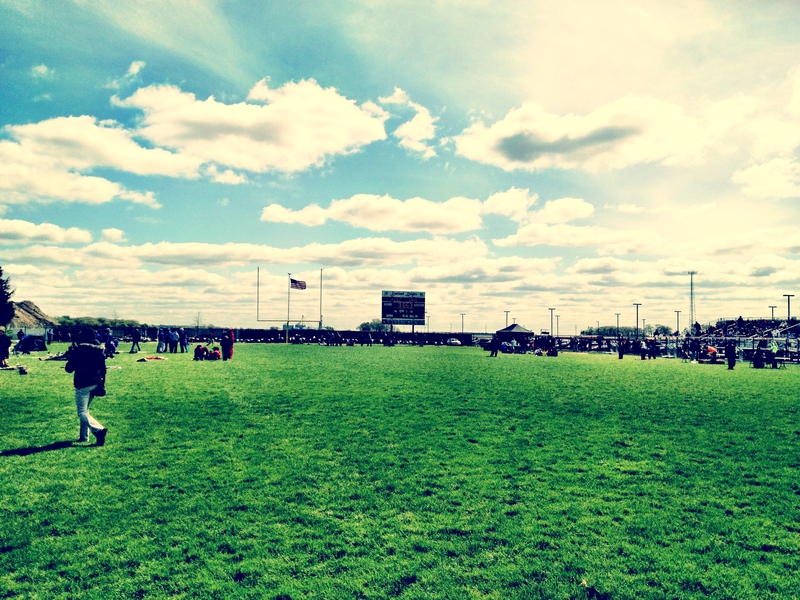 Central athletes Ben Damisch (400 meters) and Johnny Reuter (pole vault) both took home second place in their events. Fourth-place West Aurora was paced by pole vaulter Royce Golembeck, who jumped 13-06 to capture first in his event. The Blackhawks also got strong performances in the field from Aaron Kennebrew (second place in the triple jump and fourth place in the high jump), Lijah Spears (second place in the discus) and Jonny Gosong (third place in the long jump). Fifth-place Yorkville had no individual champions but runners Jake Callahan (800 meters), Chris Kellogg (1600 meters) and Eric Baker (3200 meters) all finished second in their events. The Foxes also got third place finishes from Jake Hoffert (3200 meters) and Joe Haske (pole vault). Sixth-place Oswego East was paced by senior Kalmon Stokes, who finished second in both the 110 meter hurdles (15.77) and 300 meter hurdles (40.84). The same Wolves team of Dakoda Skenandore, Andrew Holm, Rene Salinas and Chase Skenandore took home third place in 4×800 relay (8:09.19) and fifth place in the 4×400 relay (3:32.24). Elgin’s Dennis Moore was definitely the standout athlete for the Maroons. The senior sprinter blazed his way to first place in the 100 meter dash (11.46) and fourth place in the 200 meter dash (23.72). Moore, along with teammates Terrell Campbell, Derek Moorman and DeVante King, also took home second place in the 4×100 and 4×200 relays. East Aurora sprinter Desmond Gant accounted for all of the Tomcats’ points. The electrifying sophomore earned first place in the 200 meter dash (23.07) and third place in 100 meter dash (11.61). Dundee-Crown’s highest finisher was shot putter Joe Meixner, whose throw of 137-09 earned him third place. The Chargers placed in two relays, earning fifth in the 4×200 (1:33.27) and sixth in the 4×800 (8:14.33). I wrote this story for the Chicago Sun-Times, Aurora Beacon, Elgin Courier and yourseason.com. It appears here and here. I wrote separate stories for the Beacon and Courier and combined them for the blog. Kaneland got a big boost from the top of its batting order on Monday as the Knights defeated host West Aurora 10-3. The first three hitters in the Knights’ lineup – Delani Vest, Allyson O’Herron and Paige Kuefler – combined for eight hits, eight runs and seven runs batted in. Kuefler, a freshman who has already settled in to the No. 3 spot in the lineup, went 4-for-4 with six RBI and three runs scored. Willis said the young third baseman is seeing the ball well at the plate. “She’s (Kuefler) seeing the ball like it’s a beach ball and she’s hitting that ball hard,” said Willis. The Knights got on the board early with a three-run first inning that included RBI singles from Kuefler and Lexi Roach. The speedy Roach reached base four times in the game and stole three bases. O’Herron and Kuefler both had RBI singles in the second inning as Kaneland (13-4) extended its lead to 5-0. West Aurora (3-12) scored their first runs in the third inning as Alexis Harkless’ two-run single cut the Knights’ lead to 5-2. However, Kaneland quickly responded with a three-run fourth inning. 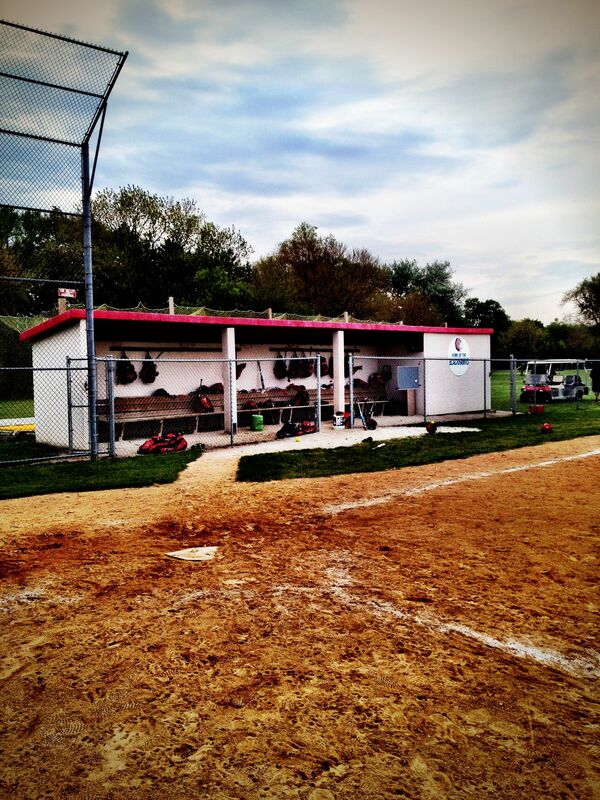 The Knights took an 8-2 lead thanks to a two-run double by Kuefler and a RBI groundout from McKinzie Mangers. Kuefler capped off her strong performance with a two-run single in the fifth inning that gave the Knights a 10-2 lead. Even though she’s only a freshman, Kuefler said her teammates have made it easy for her to play at the varsity level. Harkless added a RBI double to deep left field in the fifth inning to cut the score to 10-3. The catcher led West Aurora on offense, reaching base three times and driving in all three Blackhawk runs. West Aurora committed four errors as the team lost its third straight game. Blackhawks coach Sara Nagy said her team has fallen back into some bad habits after a stretch of three wins in four games. On a cold, blustery night perfect for indoor soccer, West Aurora and Kaneland took to the outdoors for a game on Thursday evening with the host Blackhawks grabbing a 1-0 victory. Blackhawks forward Jessica Saffell scored the game’s only goal off an assist from midfielder Karla Torres with 4:42 left in the first half. West Aurora (3-4) dominated possession in the first half, out-shooting the Knights 9-1 in the game’s first 45 minutes. However, the Blackhawks had nothing to show for their effort until Saffell’s strike hit the back of the net late in the half. “It was huge getting that goal right before the end of the half so we could go into the second half knowing that we had that one goal up,” said Saffell. West Aurora keeper Gabbie Hansem made four saves on her way to picking up a shutout. Hansem had to do most of her work in the final 15 minutes of the second half as the Knights made a late charge. Saffell had two excellent opportunities early in the second half to extend the Blackhawks’ lead, but Kaneland keeper Jordan Ginther made two diving saves within 35 seconds of each other to keep the score 1-0. Ginther made nine saves in the game. Wagley said she wasn’t surprised with the low scoring game. Forward Quincy Kellett is already making her mark on the Rosary girls soccer team, just two games into her high school career. The freshman scored both of the Royals’ goals in the team’s 2-0 victory over Kaneland on Wednesday afternoon in Aurora. The goals were Kellett’s first in a high school game. Rosary (2-0) head coach Kristy Kane was pleased to see Kellett rewarded for the hard work the freshman has put in at practice. Midfielder Kaitlin Johnson’s perfect entry pass set up Rosary’s first goal. Kellett received the pass, split two defenders, and put the ball in the back of the net from five yards out to give the Royals a 1-0 lead with 17 minutes left in the first half. In the final minute of the first half, Kellett scored her second goal of the game off a beautiful crossing pass from midfielder Molly Piech. The Royals have won their first two games of the season, and Kane credits the positive attitude the team possessed before its first game. I wrote this story for the Chicago Sun-Times and Aurora Beacon.